In Israel, Some Wonder Where The Outrage Is Over U.S. Anti-Semitic Acts : Parallels Some Israelis criticize Prime Minister Benjamin Netanyahu for offering a less forceful response to anti-Semitic acts in the U.S. than elsewhere. Some say he wants to keep pressure off President Trump. 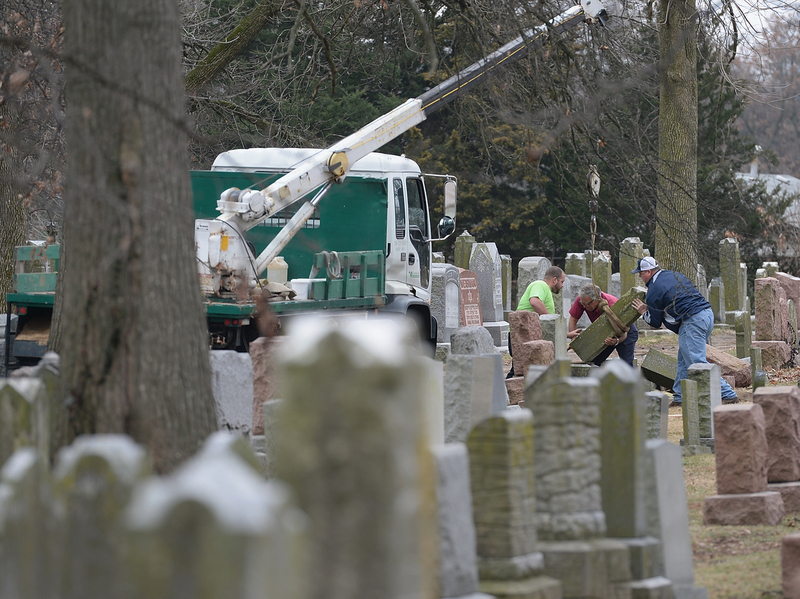 Volunteers from a local monument company help to reset vandalized headstones on Feb. 22 at Chesed Shel Emeth Cemetery in University City, Missouri, a St. Louis suburb. Since the beginning of the year, there has been a spike in incidents around the country, including bomb threats at Jewish community centers and reports of anti-Semitic graffiti. The president has frequently deflected questions about threats and attacks against Jewish institutions. Last week, Trump called a question he was asked about anti-Semitic incidents "repulsive" and "disgusting." But on Tuesday, he called the recent incidents "horrible" and "painful." Netanyahu, for his part, insisted Wednesday during a trip to Australia that Trump has taken a "strong stand against anti-Semitism." But before this, the Israeli leader hadn't issued any public statements about the most recent incidents in the U.S.
Netanyahu's muted response has drawn criticism, including from Yehuda Bauer, the academic advisor of Yad Vashem, Israel's Holocaust memorial and museum. "He follows President Trump," Bauer says. "He did not react immediately." Bauer believes Trump "is not an anti-Semite. But his attitude, his policies, encourage people who develop hatred toward other groups. So it's an atmosphere that he represents." Daniel Shek, a former Israeli consul general in San Francisco, says Israel's government usually speaks out about overseas incidents like these. 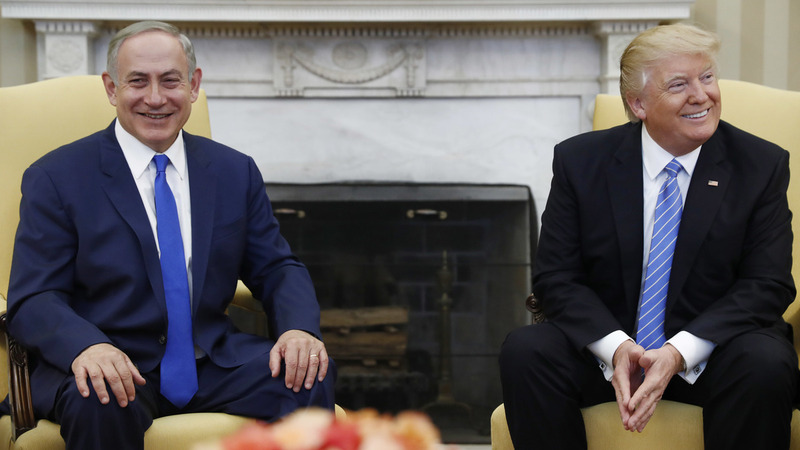 President Donald Trump and Israeli Prime Minister Benjamin Netanyahu met in the White House on Feb. 15. Netanyahu's muted reaction to the most recent threats and attacks on U.S. Jewish sites has drawn criticism from some in Israel. "For much less than what has been reported is happening in the U.S., there would have been an uproar here, and rightly so," he says. Shek, who considers himself in opposition to Netanyahu, blames politics for the reserved Israeli response. "There is so much enthusiasm in the current Israeli government about the election of Donald Trump," he says. "And they think what he stands for – I am not sure they are right – about Israeli settlements and the Palestinian issue, they don't want to ruffle his feathers in any way, even at the cost of not speaking up against anti-Semitism, which I think is totally unacceptable." Malcolm Hoenlein of the Conference of Presidents of Major American Jewish Organizations visited Israel this week with U.S. Jewish leaders, and he says Israeli cabinet ministers did express concern about anti-Semitism in the U.S. during their meetings. A former adviser to Netanyahu, Dore Gold, says he doesn't see anything wrong with Netanyahu's response. "There has been a tendency to politicize this whole issue of anti-Semitism in America," he says. "Opponents of the Trump administration want to blame it for anti-Semites coming out of the woodwork and attacking Jewish institutions. I think we should all be united in our struggle against anti-Semitism, and not look for a fall guy for what is happening." Israel trusts U.S. law enforcement, he says, to root out the source of anti-Semitic acts.